Two questions regarding removal were addressed by the District 2 Court of Appeals in Shulka v. Sikraji, No. 2013AP2080, which was recommended for publication. The first dealt with the requirement that a notice of intent to remove minor children specify the proposed location of the move. The second deals with whether the parent proposing the move can change his or her mind about the move if the court would change placement rather than approve the proposed removal. In Shulka, the parties divorced in 2007 with the mother given primary placement of the children. In October 2011, she filed a motion to remove the children from Lake Geneva to Lake County, Ill., which was granted by the family court commissioner. However, she moved from Lake Geneva to Round Lake, Ill., which is not in Lake County. The FCC then ordered her to move back to Lake Geneva and re-enroll the children in the schools there, or lose primary placement. The Court of Appeals affirmed the trial court, finding that a substantial change in circumstances had occurred when she moved to a different location than she had proposed in her motion. The appellate court affirmed the order that the children be enrolled in the Lake Geneva schools and that she return so their enrollment could be accomplished, or lose primary placement. While the decision simply affirms the trial court’s exercise of discretion as being appropriate, there are two aspects of the removal law, Wis. Stats. §767.481, which should be noted. First, the statute was amended in 1995, changes I was involved in drafting and lobbying for. Part of that amendment required persons seeking to remove with a minor child to specify the “specific beginning and ending dates and location of the removal.” Wis. Stats. §767.481(1)1(b). This is the first case to deal with that portion of the statute and, appropriately, affirms the trial court for holding the mother to her representation. In simple terms, if you tell the child’s other parent where you intend to take the child, permission to remove is specific to that location. The removing parent doesn’t have carte blanche to move wherever he or she chooses. 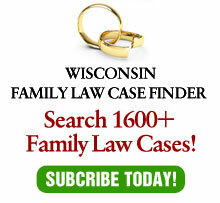 The second interesting aspect of the case was the trial court, by ordering the mother to move back to Wisconsin, was allowing her to change her mind about moving rather than having primary placement changed. While there is no provision in the statute to allow a “never mind” decision, it makes a great deal of sense. After all, placement is awarded to a parent, not a location. If one parent intends to change that location, permission must be sought and one possible result may be to change primary placement to the other parent. But, if the moving parent doesn’t move, then matters should remain as they are. Most courts, in my experience, allow the “never mind” option. While this case doesn’t expressly adopt that option as a matter of law, by affirming the trial court, it implicitly approves it. Therefore, this is a handy case for family-law attorneys to have at their disposal for those cases where a client wants to move, but would forgo it if it means losing primary placement.